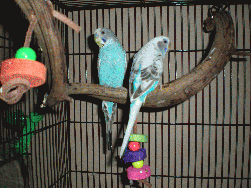 Hi - I`m Cruz, the handsome boy budgie on the left. And the lovely creature on the right is my best gal Sally. I came to Mickaboo via the Santa Cruz Animal Shelter so not much is known about my past although, since I`m fairly young, there probably isn`t a whole bunch to know. Except that I am very happy to be in a wonderful Mickaboo foster home with the girl budgie of my dreams. I`m a little more forward than Sally and have been known to step up on a hand now and then - especially when food is involved. Though I`ve become a little shy lately, with a bit of time and patience, and perhaps a little millet, I could surely be coaxed to step up on a friendly hand again, especially if that hand was taking me and Sally to our forever home. So, if you`re interested in hearing a little more about me and my gal, contact our adoption coordinator.